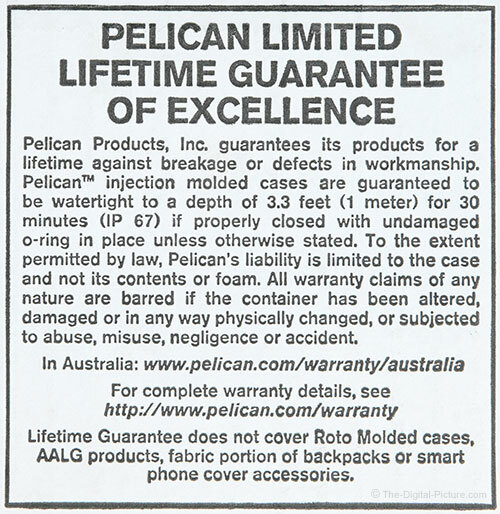 The brand name "Pelican" has become synonymous with the word "indestructible". While not literally bulletproof, the figurative use of this word seems a good descriptor for Pelican's full line of hard cases. Simply put, Pelican hard cases take the worry away. 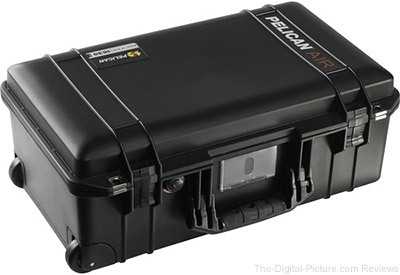 The Pelican 1535 AIR Hard Case is dimensionally very similar and purposefully identical to the Pelican 1510. I have had at least 4 of these cases in my kit for nearly a decade and use them constantly. In addition to being the maximum allowable USA airline carry-on size, they are ideally sized for stowing a modest-sized kit or for transporting easily manageable increments of a larger kit. 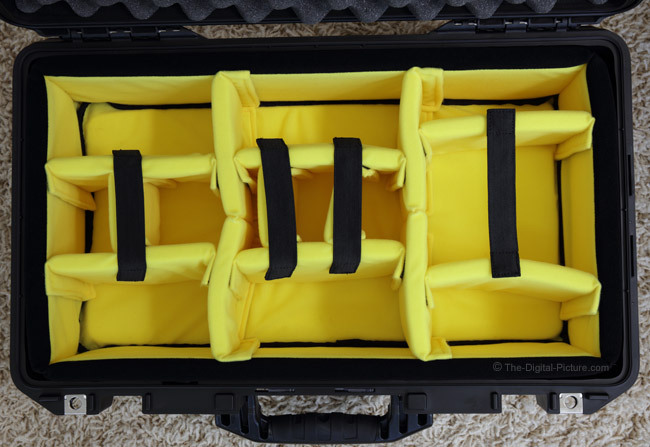 "These new cases have been engineered to maintain the same standard of durability, but reduce the weight of each case by up to 40 percent and offer new size selections not currently available in the Pelican classic or Pelican Storm lines." Same protection at a significantly lighter weight? Sign me up. Pelican offered to send me a case for review and I of course raised my hand. However, I was skeptical. How can that much weight be removed without compromising the robustness that the original case was so loved for? The front of the case is rather non-descript with some branding and model labeling. Raised ribs cross the case, providing some increased rigidity and strength and also allow the feet of same-length and width model cases to slightly interlock for stacking. Though the construction material of these cases (HPX² resin, a polypropylene blend polymer) does not feel especially slippery, these cases slide easily against each other, making the interlocking feature very helpful. Note that the 1510 case has a different foot spread and does not stack properly with the 1535. The right side of the case is the most feature-filled. In the center is a very strong, comfortable, rubber overmolded handle that folds flat for minimum dimensions. 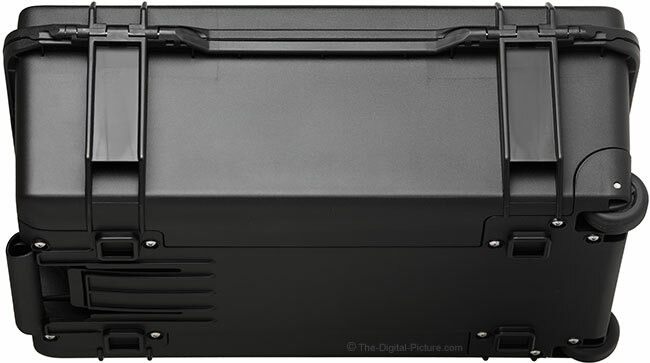 Just above the handle is a clear polycarbonate card holder that mounts in slots in the lip of the case and can alternatively be moved to the top of the case (the case must be open for the card holder to be removed and installed, no tools required). To the left of the handle is an automatic pressure purge valve, preventing high internal or external pressure from compromising the sealing of the case while keeping dust and water out. The ABS plastic valve features a Hi-flow Gore-Tex 3-micron hydrophobic non-woven material and a 70 Shore Nitrile O-ring. The 1535 has a pair of double-throw latches that snap firmly into place. I've used cases with four latches and although 4 latches are needed on larger cases and can provide even better locking security, having only two is ideal for working speed. Two latches are very adequate for my uses of this case and a pair of metal-reinforced holes are provided for user-supplied padlocks or tie straps. With a wide lip (wider than on the 1510) extending to the handle supports, this case provides some interlocking to insure the lid closes in the proper position (I'll talk about lid flex later). Doubling as a carry handle when retracted is the trolley handle. Released by a pressure catch just below the handle, the trolley handle extends 16" (406mm), from 22" to 38" (559mm to 965mm). With such a handle, wheels are of course expected and the Pelican 1535 has these. A pair of rugged wheels extend outward enough to raise the case over normal flat surfaces such as floors, sidewalks, etc. for easy transport of even very heavy weights. Four molded-in feet are provided on the bottom of the case, allowing the case to sit nicely on flat surfaces and as already mentioned, to stack on same-model cases. If stacking multiple similar cases together is important to you, multiple 1535 AIR cases will need to be acquired (or minimally, same length and width cases). The left side of the case of course gets the hinges. These hinges are quite strong and positioned in a solidly reinforced section of the case. Note that the center of the raised sections extending below the hinges are hollow. Like all other sides of the case, the bottom has the lip between the lid and the rest of the case. However, in this location, the lip and the wheels combine to create a stand-up base. Those familiar with the 1510 case model will immediately notice the omission of the center top handle. I assume that it was removed for weight savings, but ... I definitely miss it. When transporting the case, I usually carry it from the top handle, allowing the case to be set down and picked up without bending over. While the trolley handle can be used to carry the case in this orientation, it is not balanced and the case swings inward, hitting my leg while I'm walking unless I hold the case outwards (which is not great for the shoulder and can unbalance the load pulling on your back). If you decide that the 1535 AIR is not the right size for you, no worries. Pelican has a wide range of sizes immediately available and many more coming soon. As shown above, the 1535 weighs considerably less than the 1510 (empty weights compared). My scale has the empty 1535 weighing in at 8.75 lb (4kg) and the 1510 at 12.40 (5.6 kg), for a very significant 3.65 lb (1.66 kg) or 29.4% weight loss in this equivalent model. The padded dividers from my 1510 weigh in at 1.3 lb (.6 kg) and the TrekPak layout I'm using in the 1535 weighs a similar amount – 1.55 lb (.7kg). Actual measurements show the 1535 to have picked up about 3/4" x 3/8" (19 x 9.5mm) in interior length x width over the 1510, thanks to design improvements. 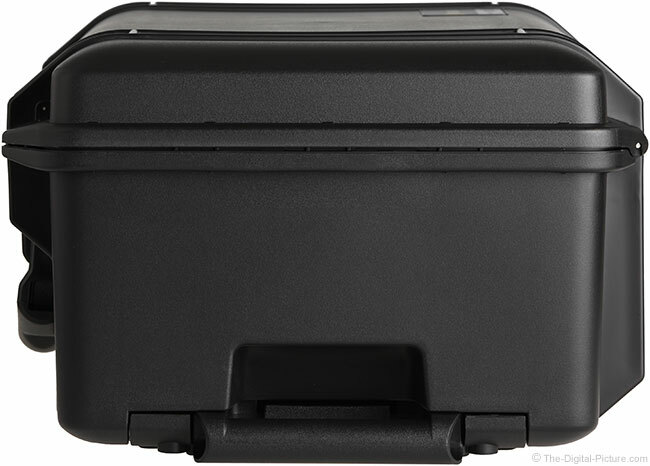 The Think Tank Photo Airport Security V 2.0 is a great high end case with similar exterior dimensions. For perspective, the 1535 AIR weighs less than this case even with interior padding installed. The 1535 AIR is available in one of four interior options. Empty is the least expensive, but it offers no additional content protection (1535AirNF). If carrying sensitive camera gear in the empty case, simply pack the gear in a case before putting it into the empty Pelican 1535. Perhaps you carry your camera in a toploader-style case and have cases for your additional lenses, flash and other items being transports. In this situation, just the highly protective shell and consolidated transport features of the 1535 are needed. Cleaning the inside of an empty case is just as easy as cleaning the exterior. The second-least expensive model features Pick-N-Pluck foam (1535Air). The lid of this model is protected by a 1" egg crate foam with a smaller dimensioned 5/8" (16mm) thick foam above it for additional padding. The egg crate side of the foam compresses more easily than solid foam, better holding contents in place with strong pressure being applied. The rest of the case is designed by you. The Pick-N-Pluck foam fills the entire case. Lay out the gear you want to place in the case and pick out the foam for a custom fit, very potentially creating the ultimate protection. Next up on the cost scale and providing much more flexibility is the padded divider option (1535AirWD). This option again features the 1" egg crate foam plus 5/8" (16mm) foam lid protection. The rest of the case is padded with approximately 1/2" nylon-covered foam with similar nylon-covered hook-and-loop attached padded dividers. Simply place the dividers in the case as desired and move them if needs change at any moment. This is the option I have in all of my 1510 cases and I highly recommend it. The new color being shown for the AIR padded dividers is yellow, making it easier to find small dark-colored items that could be easily hidden in the predecessor's most recent black color (it had been gray before that). 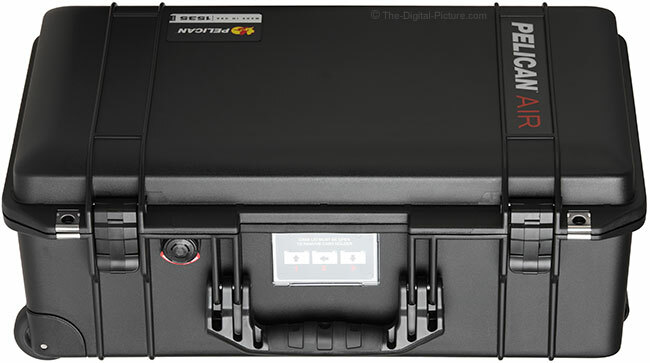 The premium-priced 1535 AIR model features a TrekPak insert (1535AirTP). I had not used this option before and was glad to find that Pelican sent me a TrekPak insert in my evaluation case. Once again, the lid gets 1" egg crate foam plus 5/8" (16mm) foam lid protection with this option. The bottom of the case gets a rather dense 1" thick foam padding. Note that this foam has cutouts for the wheel hubs and the top handle cutout, leaving sections without padding. I addressed this exposure by cutting a piece of divider to lay in each of the 4 corner sections of the case. The TrekPak dividers account for the balance of the interior protection. TrekPak dividers are 3 3/4" (95mm) high and 7/16" (11mm) thick and made of firm closed cell foam laminated to a rigid, durable, corrugated plastic. An easy to use tool is provided to cleanly cut the dividers to the desired length for a custom case layout. Divider sections are attached to each other using steel U-shaped pins that slide into the corrugated plastic slots in the divider sections. Even though the dividers are attached at the top only, the pins are long enough and the dividers are rigid enough that the bottoms are not likely to kick out to one side or the other without considerable pressure, keeping your gear in place. The U-pins are easily removable (especially if the provided red tabs are used) for flexibility in layout. The entire perimeter of the case is lined with a pair of these dividers, provided the needed surrounding protection and providing the needed U-pin slots for divider placement. In addition to the peripheral padding that comes installed, 5 sections of TrekPak are provided. Two sections measure 20" (508mm), three measure 15 11/16" (400mm) and one measures 6 7/8" (175mm). With the configuration I created (shown below), I have a full 20" (508mm) section remaining unused. Twenty-two U-pins are provided and 8 remain unused in my configuration. A basic requirement for case selection is what fits in the case. For photographers, a camera will often be priority #1. With the 2x thicker foam padding under the TrekPak option (vs. the padded divider option), a gripped/pro body is a very tight fit. The foam compresses and the case closes, but the lid is under enough stress that I'm not completely comfortable with the sealing. I frequently carry pro bodies in the Pelican 1510 cases with the padded divider option and though snug, I do not have concern with the lid flexing (the 1510's lid is also more rigid). A non-gripped body fits very easily in this case, including many of them at the same time. In my Pelican cases, I usually have a section segmented off for a camera (gripped Canon EOS 5Ds R shown) with a lens mounted, permitting fast use of the camera. In the TrekPak insert layout shown above, I allowed room for a lens up to 100-400mm zoom in size to be mounted (a 70-200mm f/2.8 lens is shown). Simply inserting a divider between the camera and lens permits them to be transported separately, a better idea if the risk of abuse is high (such as during airline travel). 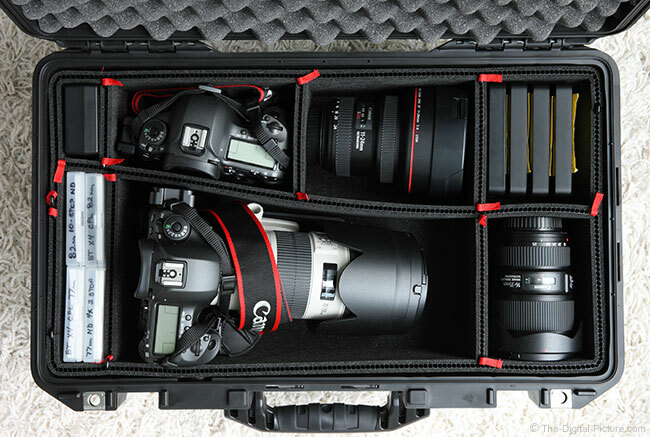 The second camera shown in the above case is an ungripped Canon EOS 5Ds R. The two additional lenses are the Canon EF 11-24mm f/4L and Canon EF 16-35mm f/4L IS. While I would store these upright in the padded divider case option, they were slightly too long to comfortably fit in this orientation over the thicker TrekPak foam base. Positioned on their side worked fine. Again, I have a layer of TrekPak foam under the four corner sections to provide missing padding in these areas (note that the padded divider insert covers these areas). Four WD My Passport drives, a battery charger and four filters round out the case contents in this example. This illustration shows that the TrekPak inserts do not have to be installed perfectly parallel or perpendicular to each other, though my example has less flexibility in making small changes as the dividers are not all the same size. Pelican later sent me the padded insert option to try in the 1535 AIR, and as expected, the thinner bottom padding made the difference necessary to comfortably hold pro bodies vertically oriented. The layout of the padded dividers is different than they were with the 1510. Which you prefer will depend on how you load the case. In my example above, with a lens and camera combination that exceeds the case width, I had to get creative with the layout. The original layout would very nicely accommodate three camera bodies with shorter lenses mounted. While the TrekPak dividers are the nicest option, my preference is for the padded divider option because of the thinner bottom padding and full bottom of the case coverage. The extra space is more optimal to the specific gear I carry most often. If you have used a variety of brands of hard cases, you understand that the amount of flex in the case, especially the lid, is a differentiating feature. One downside that is also an upside is the added flex this case has in relation to the previous model. My instinct says that the more-rigid case is stronger and offers better protection and a longer life. Reality is that modern construction materials (especially those used in this case) are extremely resilient and while a rigid case seems more durable (and better invites standing and sitting on), a case that has some flex does not transfer impact as harshly to the contents, buffering the blows. Very roughly comparing, the same weight pressed on the front of the 1535 will depress the case 3x more than it does the 1510. Pelican has addressed concerns of gear damage occurring because of the lid flex by including the additional piece of 5/8" (16mm) foam over the standard egg crate lid foam (this is not present in the 1510 lid padding). 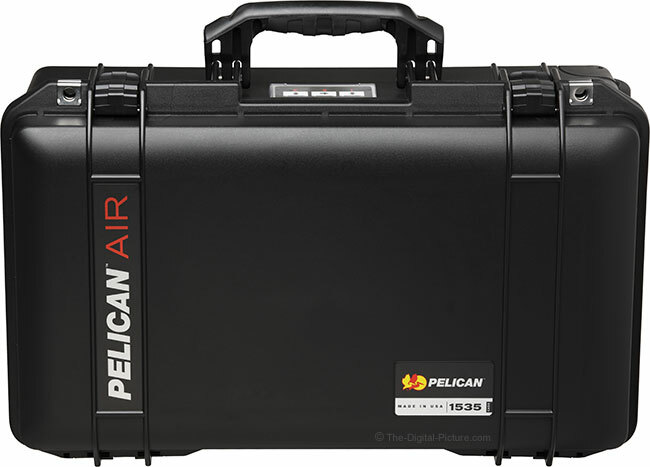 I highly doubt that I'll ever damage the 1535 AIR and, backing it with lifetime guarantee (contents excluded), Pelican doesn't think I will either. A great Pelican case feature I have not yet mentioned is the watertight O-ring gasket that wraps around inside the lid of the case. While a lot of weight must have been placed in the case to allow it to be submerged (the buoyancy rating is 64.80 lbs / 29.4 kg), a Pelican promotional video that I watched (and have not found again) showed this case being towed under the water. Pelican cases are my first choice for use in boats ranging from small canoes up to high-powered sport boats. 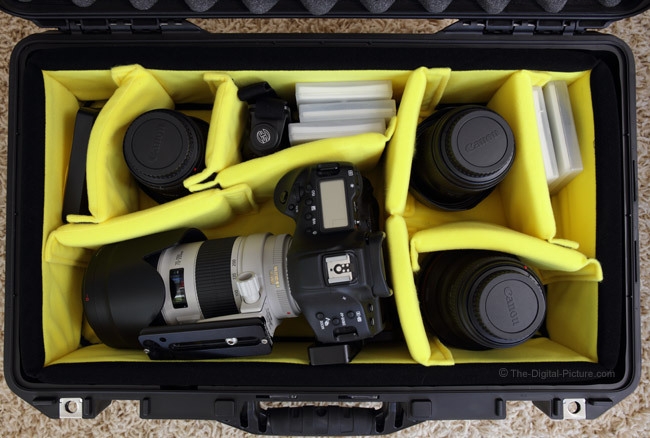 I usually take a Pelican case if I am going to the beach (I often throw a light-colored towel over the case to avoid overheating under mid-day sun) and other locations where wet or dirty is likely to happen. While Pelican hard cases are military grade, it was never embarrassing to show up at a photo shoot with Pelican cases as they give a strong impression that one is serious about their work. 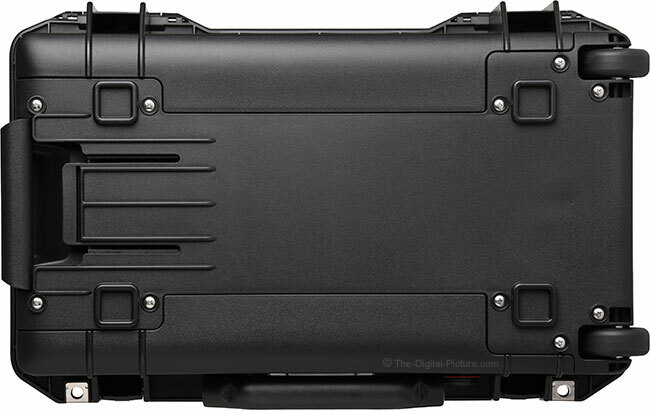 The new AIR cases have a more-solid black color than the prior cases, giving them an even higher quality professional look. 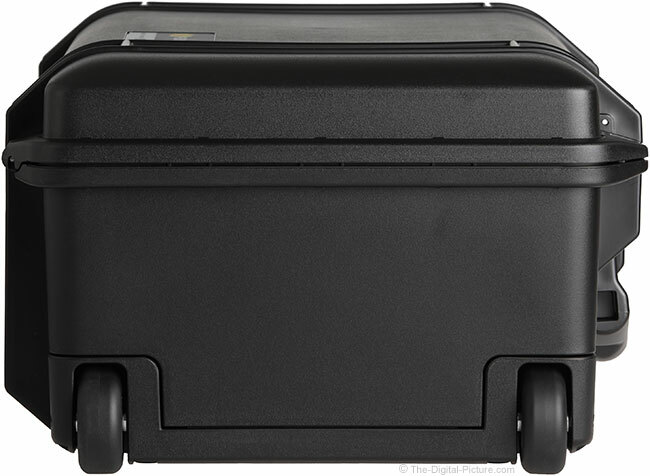 The overall case shape has a more modern appearance with the trolley handle area being especially visually upgraded. Knowing that the gear I remove from my Pelican cases will not have suffered impact damage on the way to the shoot is stress reducing. 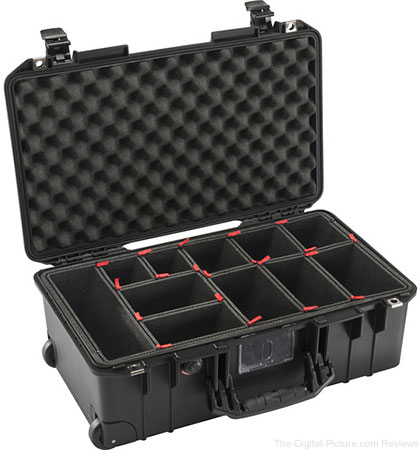 Place the Pelican case in the car trunk, through the light stands, golf clubs, dive weights, etc. on top and rest comfortably knowing that your sensitive contents are in good hands. 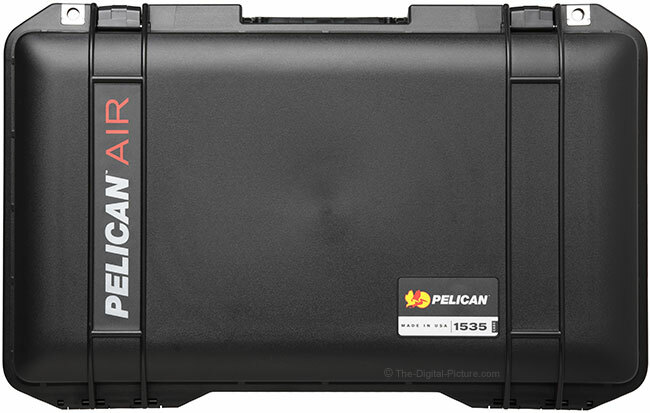 The Pelican 1535 AIR is another "case" of less is more (pun intended). The biggest disadvantage of the predecessor cases was heavy weight and the AIR line has addressed this issue. While a hard case of any type is seldom going to be a good choice for long distance carrying, these cases are perfect for transport, storage and protection. As I said in the beginning, Pelican hard cases take the worry away. I can pack the case in the SUV and not worry about what someone might throw on top of it. Sandy towels, wet wetsuits, muddy dog, etc. result in no fear for the gear. While I am going to miss the top handle on the 1535 AIR and am quickly growing used to the slightly increased flex, the lighter weight was easy to fall in love with.